The entirety of the Moreno Hill Formation is currently represented by only three named dinosaurs: the ceratopsian Zuniceratops (as shown by our friend up above here at the White Mountain Dinosaur Exploration Center), the therizinosaur Nothronychus mckinleyi, and the poorly known hadrosauroid Jeyawati; there are also some unnamed and yet to be described theropods from the formation. 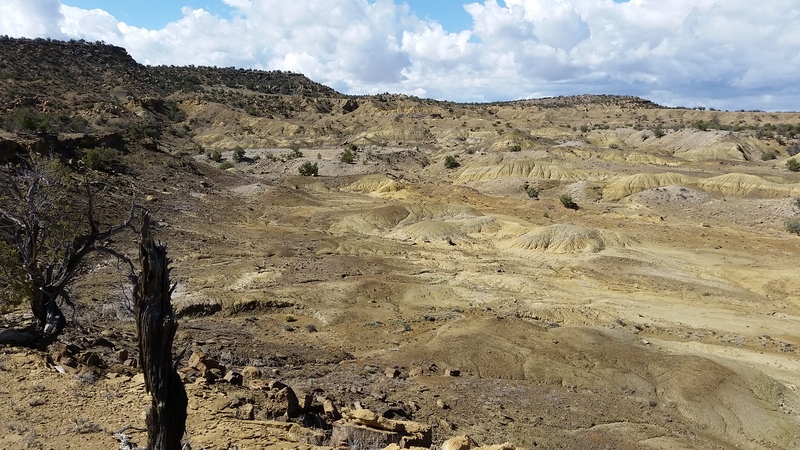 Anything we find in the Moreno Hill Formation has a good probability of being something new to science, and helping us understand the evolution of the last North American dinosaurs! 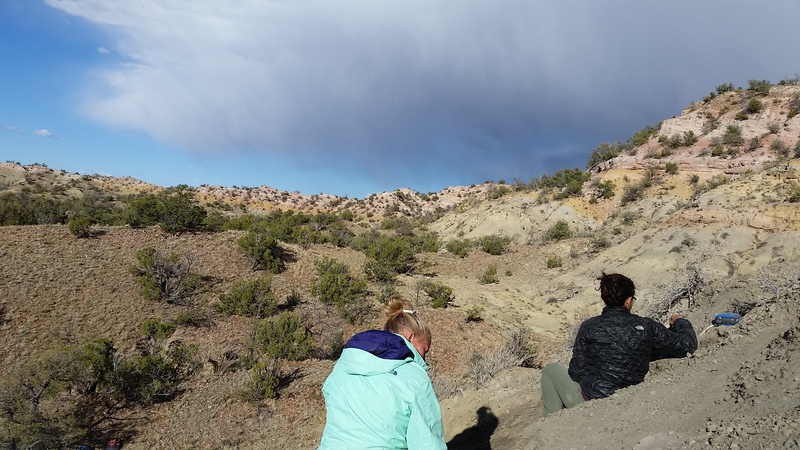 We were fortunate to have lots of good outcrop to explore, but sadly we spent many chilly days finding only fossilized wood and fusain (fossilized charcoal) or coal. We also had the pleasure of being hit with graupel (snow pellets) several times, sometimes during thunderstorms! But then, jackpot! A hillside covered in bone! 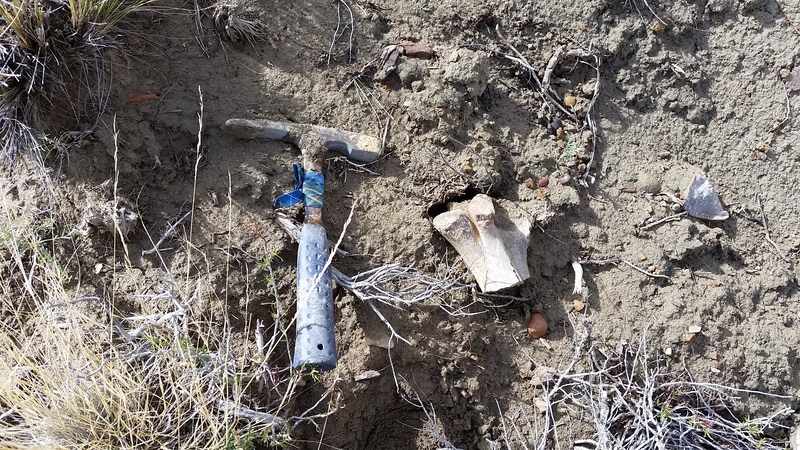 We only had a prospecting permit for this expedition, so we didn’t do any large excavations, but this particular hillside had lots of bone sitting on the surface. A very exciting couple of days! The hillside was pretty steep and it was hard to get a grip as we went higher and higher, leading to some interesting poses as we scoured the surface for bones. Also don’t mind that terrifying looming cloud. 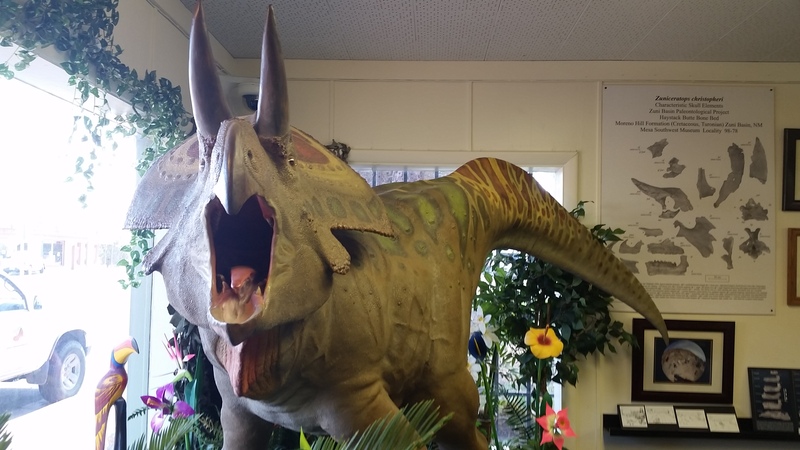 There are dinosaurs to find! 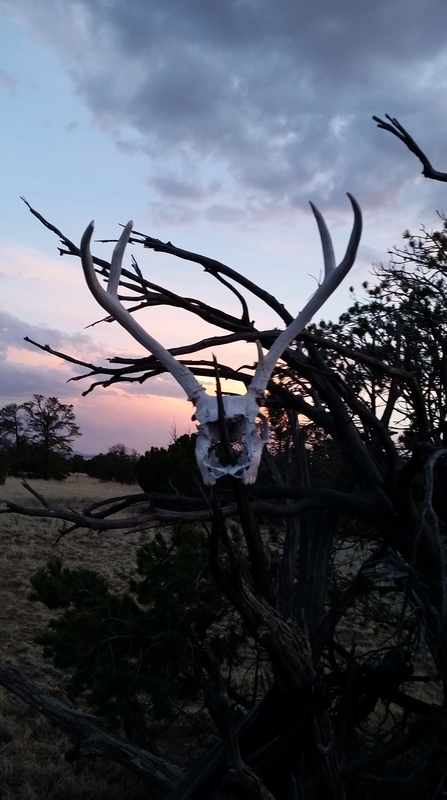 We were in an area frequented by elk/wapiti and pronghorns, and so our camp took on a bit of an ‘antler chic’ after a few days. 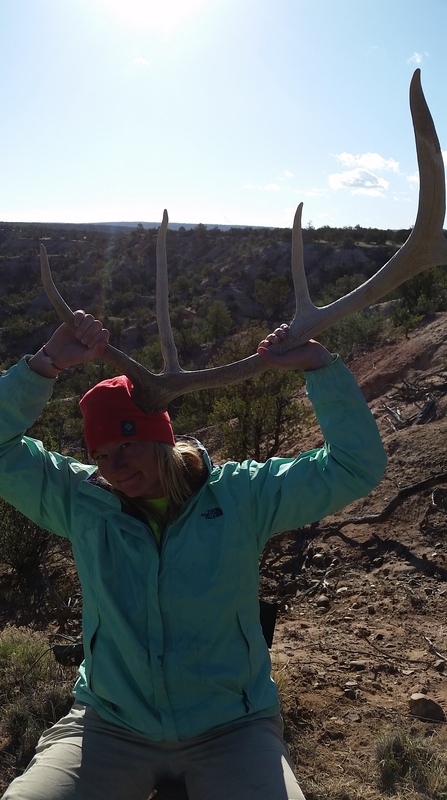 Khai found this rad skull, and Alison models a shed elk antler. 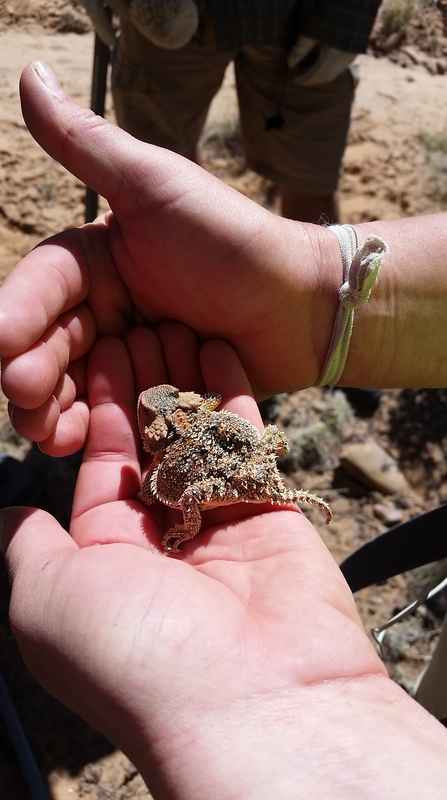 We also made some horny toad friends! These guys are just the best. The fossils we collected are back at the North Carolina Museum of Sciences now, and the next steps begin! Did we get something new? Did we find new pieces of existing species? What did we get, anyway? 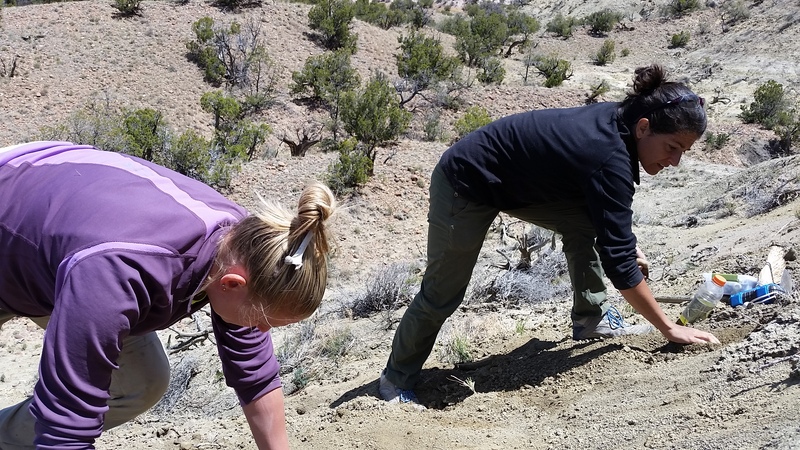 You can also check out Lindsay Zanno’s blogs about the expedition at Expedition Live! and check out our tweets using the #ZuniDinos hashtag. Next time: we visit America’s Main Street. Out of curiosity, are there any ankylosaur remains known from the Moreno Hill Formation? It seems that’s what would interest you the most. Also that horned lizard appears to be a greater short-horned lizard (Phrynosoma hernandesi). Just thought you’d like to know. As far as I know, there aren’t any described ankylosaur fossils from the Moreno Hill and I haven’t heard of any through the grapevine. 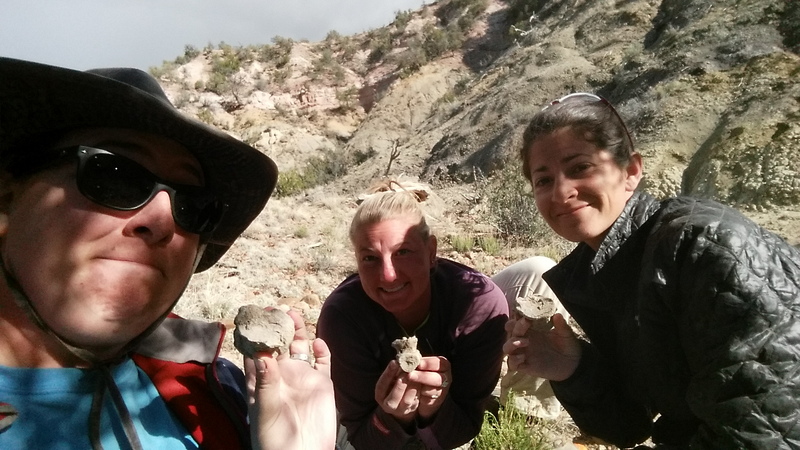 I was hoping we’d find some osteoderms at least, but so far no luck. Thanks for the lizard ID, also! I only spotted this fellow, but on that particular day the team came across at least 4 or 5 while prospecting, so they must be reasonably abundant in the area! “….unnamed and yet to be described theropods…” there must be a tyrannosaur(oid) there, given the long ecological association with ceratopsians, therizinosaurs and hadrosaur(oid)s. Probably something like the coeval Timurlengia.